I was introduced to this "Kaeng Om Gai" by one of my friends who was originally from e-saan. Its a love at first bite! Its so aromatic, very light and delicious. This rustic soup is very healthy. I just love it! 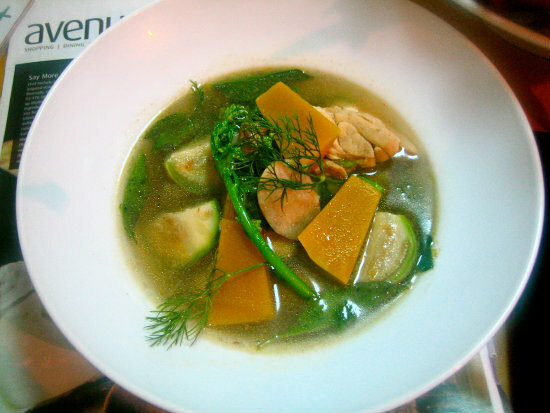 Everytime, I was invited to dine at this friend's place, I begged her to cook this rustic soup for me. Later, I asked for a recipe and created my very own version which is absolutely addictive. Please, note that my recipe is not the same as the typical e-saan style recipe as I adjusted the flavour to suites my personal taste. There are 2 different ways to cook the paste. 2) Set a large saucepan over medium-high heat, add sliced galangal, shredded kaffir lime leaves, shallot, garlic, sliced lemon grass and crushed fresh chillies in, add 2-3 tablespoons of chicken stock. Stir fry till aromatic. Add chicken pieces, keep stir-frying till the chicken is almost cooked through. Add fish sauce and the rest of chicken stock. Bring to a boil. Add vegetables (add vegetables that take longer time to cook first and the ones that are easily cooked later). Taste if more seasoning is needed. (I add the tamarind paste at the very last minute before serving.) Sprinkled with dill, lemon basil & spring onion. Turn off the heat. Serve hot with a cup of steamed wholegrain rice or sticky rice. Absolutely delicious!